The confusion probably stems from the fact that “costume designers” get top billing in the credits in film and theatre, and people who are not in the business don’t realize there are so many different classifications of costumers within the “costume department”. Let’s face it, “designer” simply sounds more impressive to outsiders. Allow me to clarify (and introduce you to) some of the lesser known titles within the costume world (there are a lot of parallels within the fashion world but I am less familiar with the specifics in that industry). A costume designer is the “idea” person. Most designers work closely with the director and actors to create costumes that coincide with the director’s artistic vision for the look of a production. Just as a director usually gets overall credit for a movie or theatre production, despite having a crew of behind-the-scenes artisans, a costume designer is often assumed to be capable of doing everything from sketching the ideas to actually constructing a physical garment to match. While some designers work their way up through the costume construction ranks, many do not. Simply put, some designers are artists who can draw and paint beautifully, making it easy for the other costumers under them to understand what they want to create. Others are very good with verbally explaining their ideas either to a hired sketch artist or the costumers who actually build (or shop for) the costumes. Some designers don’t know how to sew a single stitch. Others know the basics (but may not be very good at construction) and are able to communicate well with those who are hired to sew. Occasionally, a designer will have started out constructing for other designers (but this is rare, as most of us who love to build enjoy the actual building process too much to give it up). Designers deal more with concepts, meetings, and paperwork (including budgets). A good designer is opinionated enough to decide what every individual character should wear and the general look of the costumes in a production. This is the main reason I do not consider myself a designer – I don’t care enough about what everyone is wearing. But I do care that they are wearing their clothing well. I have a need to tweak and adjust costumes on actors but I do not feel compelled to tell them what they should be wearing. I tend to focus more on the details. Some productions have as few as two people doing all of the costume work, while others employ multiple costumers who divide the work into very specific tasks. And not all costumers can sew. The costume supervisor ranks below the costume designer on a film crew. Duties include scheduling & being there for fittings, dealing with producers and actors directly, and generally overseeing anything that may come up during the shoot when the designer is not present. Supervisors tend to bounce back and forth between set and basecamp during filming. They also help with paperwork. A set costumer goes to the film set when there are actors filming and keeps an eye on costume continuity during the shoot. The Key Set Costumer usually works with the leading actors and manages any other set costumers that might be there to help during the larger scenes. In stage theatre, the term dresser is used for costumers who help actors backstage with costume changes during a live performance. I’ve only ever seen this title on a call sheet (the daily shoot schedule & times that crew is called in to work), but the costumer who is working on the wardrobe trailer at basecamp makes sure that actors’ wardrobe is laid out in their dressing rooms/trailers throughout the day. When they’re not doing this, they may do some laundry and prep for the next day of shooting by pulling & steaming/ironing anything scheduled to be worn. The inside of a film crew’s wardrobe trailer. Read more about it in this post. 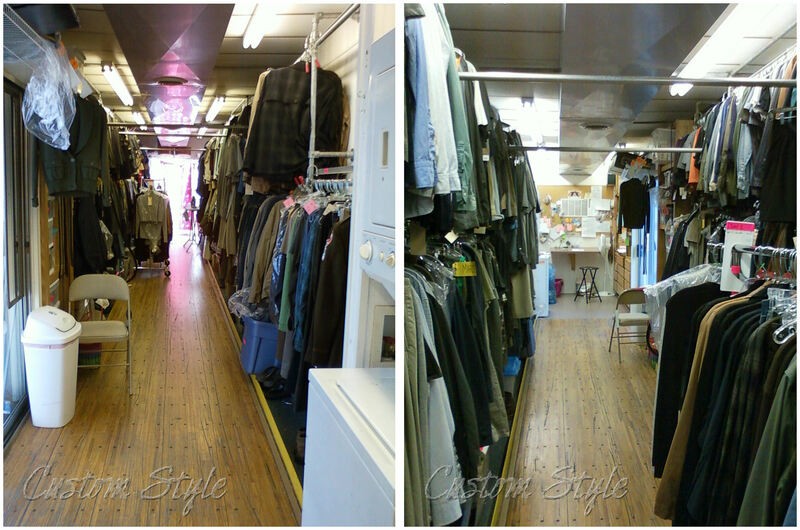 The entire costume department reports to the wardrobe trailer and may take turns working there during the day, but one designated costumer is usually assigned to work there full time. They generally keep the wardrobe trailer organized as well. A costume shop supervisor or manager is similar to costume supervisor but oversees a costume shop, whether it is for film or theatre. A costume shop is usually set up during pre-production and may shut down once a show has reached the filming or performance stage. A costume shop manager makes phone calls, does paperwork, and supervises the work being done in the shop. The cutter/draper is the costume shop patternmaker and the highest level of actual construction. They usually use a combination of flat-patterning and draping to create the patterns to match the designer’s sketches. A cutter/draper frequently builds the muslin mockups to test their patterns before using the fancy fabrics. They often calculate the amount of materials needed and cut the fabric. 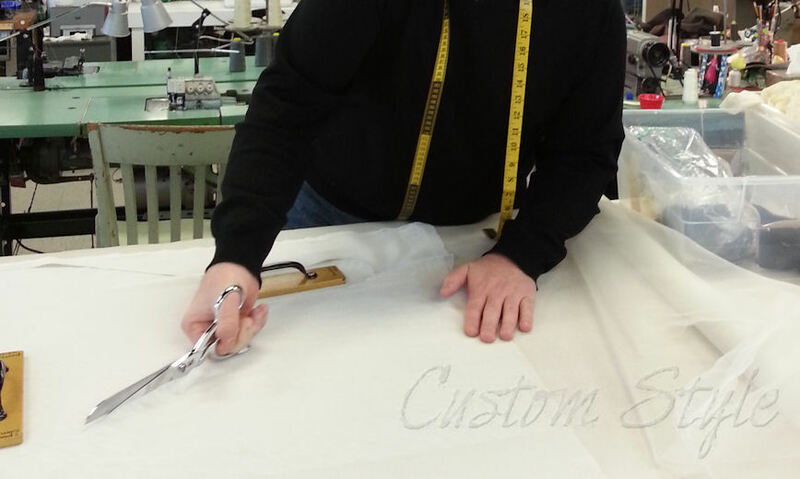 A professional cutter/draper cutting fabric in a costume shop. After the pieces have been patterned and cut, the cutter/draper explains the methods and order of construction to the stitchers working under them. The cutter/draper does the actual fitting on the actor and makes any necessary corrections to the patterns. 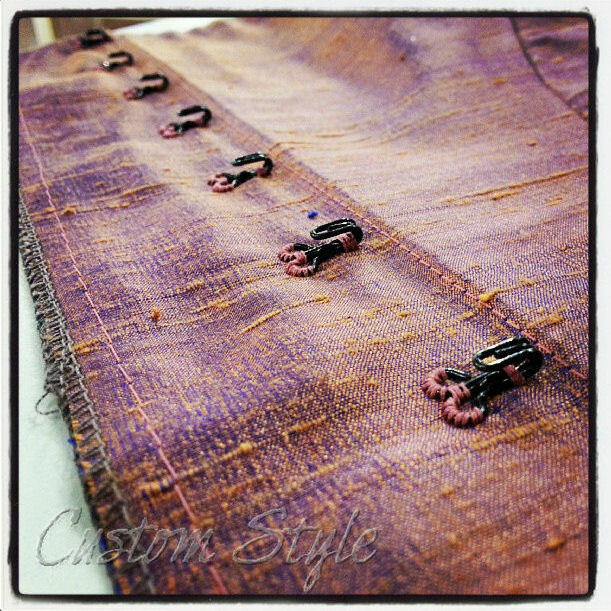 A cutter/draper will often help sew when everything for a production has been patterned and cut. A first hand is the cutter/draper’s assistant. They help with cutting and may do some of the patterning and sewing. Not all costume shops have a designated first hand. Stitchers (aka seamstresses and sometimes “costume technicians”) are the builders in the costume shop. They take the pile of pieces from the cutter/draper and assemble them according to the cutter/draper’s direction. Construction is usually completed to a point for a fitting with the actor and then finished after the fitting. A stitcher’s work during costume construction. A stitcher is not the same as a tailor although there is some overlap. A craftsperson may be a milliner or someone who paints or dyes fabric. Often the duties of a craftsperson overlap with those of a props person in that they create the accessories that go with an actor’s costume. Glue & paint are used more often than a needle & thread by a craftsperson. A shopper is the person who buys whatever supplies or clothing can be purchased for a production. They are also responsible for receipt paperwork and returning unused items to the store from which they were bought. A costume intern (or PA in film) is usually someone still in school or just recently graduated who helps in a costume shop or production office with anything from paperwork to overnight laundry. 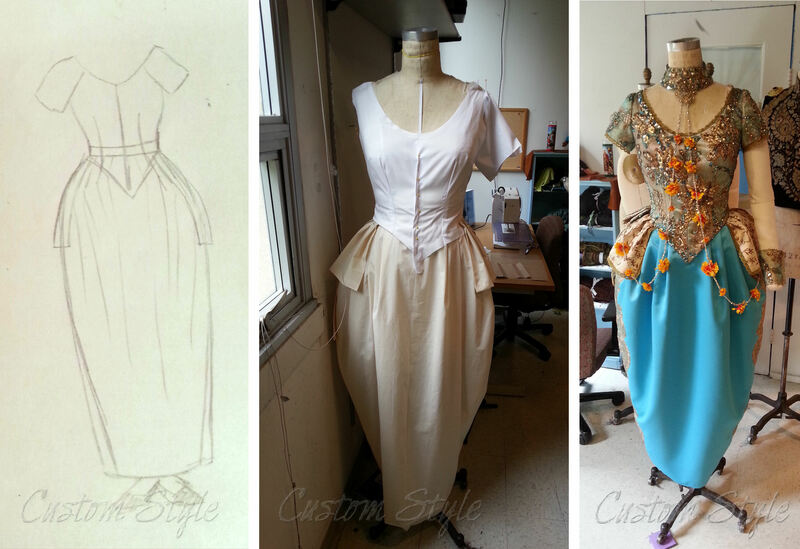 From the designer’s sketch to the cutter/draper’s mockup to the stitcher’s completed costume. So that’s the basic breakdown – the bigger the costume department/shop, the more specific titles and positions there are beyond those I’ve listed. Even though I’ve done various amounts of all the above positions, I consider myself to be mostly a Costumer and a Stitcher. I’m happiest as a builder because it’s my favorite part of the costuming process. I just wish I could do it full time. For those of you who love to sew, which costuming position sounds the most appealing to you? Do you consider yourself more of a stitcher like I do? Yeah, being a dresser is rather slow and boring unless it’s a really fast paced show or you have tons of quick changes. I only like being a dresser for the traveling shows that come through my area because I only have to do it for a few days – just long enough that it’s new and somewhat exciting (adrenaline rush of not really knowing what you are doing) and you have time to perfect it by the end of the run but don’t have to travel with the show. I would be SO bored if I traveled with a show. Design work on a small scale isn’t too bad. I’m sure you will have fun with the steampunk ball! Wow, that was a fun read! Thank you for taking the time to share all of this, I learned a lot. I think I would be like you and want to be a stitcher. The pattern making and fitting would be fun, if it was just once or twice. Sewing is my favorite part of sewing :-). It can be fun picking out the pattern or fabric (or frustrating, depending on the day!) but the real fun is watching the garment come together. Thanks! So glad you enjoyed reading it! The sewing is definitely the most satisfying because you can physically see how much you’ve accomplished in a day. Brooke, I just somehow came across your Blog…probably throught The Vintage Traveler Blog. Liz did an article about my mannequin heads, at one time. I happen to be an overactive 82 year old. I found your comments on “I am not a designer” most interesting. I consider myself a “One Act Pony” I jump around from project to project in many areas. My favorite area of “Design” is sketching an idea…then figurine out which/how to get the fabric to do what-ever need be. I am signing up for your Blog….I think I love it. Oh, thank you so much! I remember that post on The Vintage Traveler – you do amazing work! And I always enjoy your comments over on Lizzie’s blog so much! I’m honored you find my blog interesting. At home with my home business, I’m pretty much a one-man-show having to do everything by myself, but the actual construction is by far my favorite part. I find keeping motivated and on task (too many ideas and getting bored and wanting to move to something new) is the hardest part of working alone. I get amazing amounts done when I’m not working by myself even if I just have someone in the room to talk to and keep me company. Fascinating post, Brooke! Thank you for sharing. I loved your breakdown and explanations of all the different classifications for wardrobe/costumes. Through my experiences, so much depends on the project and the people you get to work with as to what position you want to be apart of. I find that being the ‘peon’, not meant to be derogatory, can often be the most satisfying and least stressful. As the seamstress, hopefully a skilled one, it can be very satisfying to see your part in the big picture. Unfortunately, not all designers fully appreciate a skilled seamstress in their department, but those who do will certainly let you know. Great pictures to go with your explanations. I especially love the beautifully stitched hooks. Looks like Couture work! Thank you! Yes, give me a decent paying but “peon” position any day! It’s so nice when you have others working above you to be buffers between the frustrating parts of costuming. I have the habit of getting paired with designers on the low budget stuff that weren’t expecting someone who can sew and then they think they can have anything they want built (despite the time and budget limits). Hoping to avoid those kinds of jobs in the coming year! What we do is so hard to summarize, isn’t it? I love the rush of quick changes! I once worked backstage on the play “Our Town” and the only fun part was the quick change at the end of Act 1 when I had to help the lead into her wedding dress before intermission. I think we had less than 30 seconds total, but by the end of the play’s run we had the change down to something ridiculous like 12 seconds. The rest of the play was a major snooze backstage just waiting for dirty laundry to do at the end of the night. Musicals are the most fun – usually lots of flashy quick-changes! The best quick change show I ever worked was a show called “On the Verge” in college in which one person plays like 6 different different characters ranging from a gas station attendant, to jungle cannibal, to geisha, and a yeti among other things. We had more choreography going on back stage to make the changes (just two dressers) than there was for the entire rest of the show. It totally rocked!! “Secret Garden” was awesome too, just for sheer number of cast members. Oh my gosh! On the Verge was my college senior year thesis! I already knew I didn’t like designing when they asked me to do it, but I designed it anyway because it was an interesting show for costumes. We did the last quick (complete!) change for Alex behind a scrim upstage so we couldn’t use any velcro or loud snaps (but at least we could see with all the stages lights shining through on us). Two of us put her in capris and a button-down shirt and had to do all the buttons in the time it took Mary to monologue! (See photo in bottom right of this Instagram pic.) And we made it in the time every night! That was a crazy play – you are the first person I’ve come across who knew what it was. You too! I had no idea it was ever done anywhere else! I think we were the debut performance back in 1993? maybe? The playwright came out special to see it – I think she was from Oregon or something – all the way to Fargo, ND where I was attending NDSU. It was my first real introduction to backstage theater and I was totally hooked. My first show working in the costume shop too 🙂 We did the show in black box with actors entering from all sides of the box. Lots of crazy, silent racing around back stage, let me tell you!! SO MUCH FUN!! We did our performances in my college’s black box too! It’s the perfect kind of play for that style theatre. I only have such good photos because I had to include them in my thesis. I had my first fur experience with a lime green monkey (*cough-cough* ick!) for a college production of a children’s show; so when I designed the yeti, I made a huge “sack” with fur only for gloves, feet, and hood to minimize the nastiness. Thanks so much for this post! It always helps to understand more about the business you want to go into! I definitely think I’d be more suited to the stitcher, although I like to design things as well. While I don’t enjoy designing for shows, I do enjoy the small scale design work – the kind for clothes for myself or an individual friend/client. I suppose I’m more of a “stylist” in that regard – give me a few guidelines with setting & event (like when dressing extras) and a pile of options to choose from, and I can definitely put together a look or outfit. Ah yes that makes a lot of sense 🙂 I guess I’ll have to discover what suits me best show-wise, i have a feeling i might prefer to design things on a more personal basis as well. First, though, I have to find a job in a costume department! This was an incredibly interesting read! Thanks, Brooke, for the crash course! 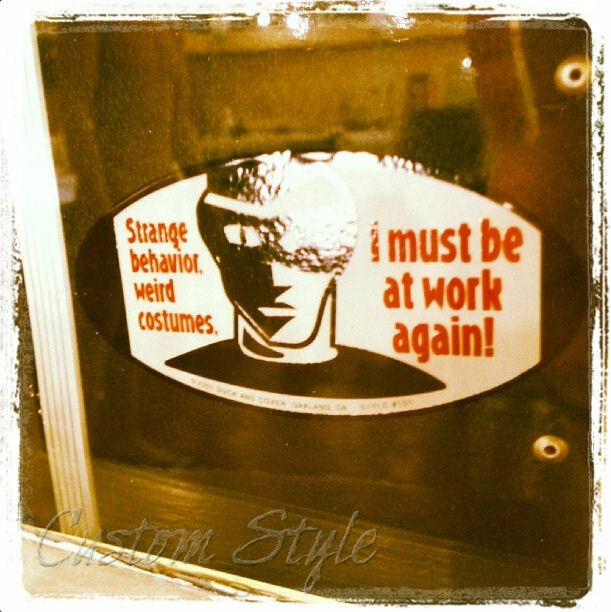 I have always been fascinated with the world of costuming, and, if time and opportunity allow in the future when my SAHM responsibilities are finished, I would love to work in a costume environment, doing whatever I could do! Thanks for your detailed breakdown of the various roles behind the scenes! Now I know how to describe what you do – or at least I can say “I know this costumer….” I’m attracted to the design side – but I have more experience on the stitching end of things. I like construction too. It’s such a satisfying feeling to finish a garment. Brooke, this was so interesting, it almost makes me want to run out and volunteer in the costuming department of our local little theater! Seriously, the job I’d pick is that of shopper. I’m all about the right textile. And I found the job of set costumer to be interesting. I’ve noticed continuity problems in movies and TV, and I’ve often wondered if there was someone who was in charge of this. An excellent, informative, and fun post. Thanks! Sadly, it is often not the set costumer’s fault if you notice a continuity problem in the final cut. That is just the way things work when you film completely out-of-order! Sometimes, it is just the luck of the film schedule (example: in the newest King Kong movie, the lady running through the jungle in a white satin evening dress slips down a muddy slope, and then there’s nothing on her a second later because the last shot was the first you see and she slipped). Sometimes, it is the director choosing to ignore both the set costumer and script supervisor (“scripty” is the main person in charge of all continuity and the one taking notes on set) and picking the acting take he wants despite continuity. Sometimes an actor is just plain difficult (“don’t touch me while I’m working!”). And other times, it’s just something no one on set noticed for whatever reason (19-hour day anyone?). The most frustrating shoots for me are the ones where no one in costumes can see the monitor – that’s when lots of things slip past to the final cut. And you never know what they will rearrange in editing that throws off continuity. It’s truly amazing that movies & TV shows end up being as perfect as they are! It takes an incredible amount of teamwork from all the departments. Really, it just sounds like too much pressure to be the costume designer, although like you mentioned in an above comment, it’s fun to do once in a while for an individual! The amount of paperwork and meetings alone is enough to make me not want to be the costume designer. I’ve worked with some designers that by the end of a show just stop wanting to make decisions about things. Brooke…thank you for the explanation of the roles of costumers. I have tried to get this across to the people I work with, especially this year with the new production model for the gowns. I work in phases and never stopped to analyze why. After reading your descriptions it occurred to me that it takes a different way of thinking for each task. It’s true each role requires a different thought process. I do all of the above for my home business but I definitely dislike some of the roles and prefer to work on a team. Anyone who’s thinking about working professionally should know that there are unions for designers, costumers, makeup artists, wardrobe people, etc. Most have apprenticeship programs, since crafts are “learned by doing” under more experienced supervision. These unions are usually organized by region. The Links page on the Costumers’ Alliance website http://www.costumersalliance.org/ will lead you to some West Coast and national sites, such as the Theatrical Wardrobe Union IATSE Local 784, and USA 829, the union for set, costume, and lighting designers. Just because you are doing work you love, that doesn’t mean you shouldn’t be paid a living wage for doing it. I’m part of IATSE Local 484, which is my regional film mechanics local that includes art department, costumes, makeup/hair, grips, etc. I did enough independent costuming projects that I was able to join (I was actually “sponsored” by a makeup artist friend). I joke that I’ve never gotten a job with my resume because I never really have! It’s truly all about who you know and refusing to do everything for “free”. My hero is Edith Head and I never realized what the differences are before your explanation. I love what you do and I have volunteered the local theater group and the local Junior College theater departments to help sew together and repair costumes. I was even given a pattern and asked to grade it up and down for several different people in the cast. My brother is in the local stage hands union. After reading this blog, I should see if he can put me in contact with the shows that film in the SF Bay Area…..!